a dim silence and a wild desert. So wrote John of Ruysbroeck in the 14th century. of a woman named Mary. ate, and laughed, and loved. So now, all that suffers, loses, messes up, and bleeds finds welcome in that dim silence and wild desert of the cross. All that is lost or broken is gathered and folded into the height and depth and breadth and length of God. Every precious particle of God’s making is held with infinite tenderness in the simplicity of love. There are moments, days, even years for some, where the work of solitude involves suffering. Alone with God, we are presented with painful truths. We are refined and purified. We gradually learn to be present to God, not on our terms, but on God’s terms in the context of our own specificity. This is the work of letting go and letting be. This is the journey of ever deepening faith and radical trust. This is the door that sets us loose to roam forever free. 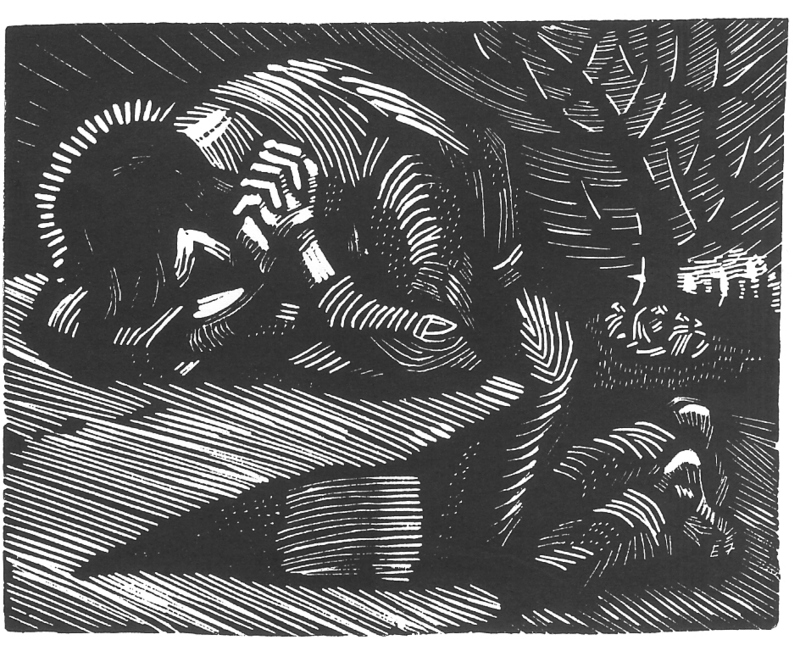 During the observance of Holy Week, the specificity of God made known in Jesus, enters into the lonely anguish of surrender to the terms of his Father. The one who has been surrounded by crowds and encircled by his chosen disciples, makes the solitary journey into death to return to the heart of all being. We find an account of this journey in the gospel of Mark. Mark’s gospel is characterized by a simple, direct, unpretentious style. The gospel has an urgency about it. Mark’s frequent use of the dramatic present tense contributes to the immediacy. The emphasis is on the action – the deeds and words of Jesus – as he confronts and responds to the religious establishment, the disciples, and the crowds. This action moves compellingly to the crucifixion. The story unfolds in a hurry, as though the very presence of Jesus has set in motion forces which lead inevitably to the cross. Then at the cross, in striking contrast to the preceding scenes, Jesus becomes the receiver of the action in total surrender. The syntax changes from active voice to passive voice, as the Greek word, paradidomai, appears more and more frequently. Paradidomai means handed over, or to give into the hands of another, to be given up to custody, to be condemned, to deliver up treacherously by betrayal. This is the same word the gospels, as well as St. Paul, use repeatedly to describe the crucifixion. As the resurrected Jesus tells Peter on the lake shore, there comes a time when we will be carried where we do not wish to go. (John 21: 18) Then we find ourselves being handed over to our life circumstances, the limits, sins, injustices, and frailties of human existence. Watch me. Trust me. Do it like this. All is forgiven. Surrender. Allow yourself to be carried into darkness. There is a place beyond your knowing or naming, where I am and you are. Follow me. where all things are born anew. What do you need to surrender, let go of, or let be this week? Not all, but much of our suffering may be tied to our defiant resistance to letting go and refusal to accept the suffering of self denial. Do you agree with Simone Weil that broad social change could be gained, not by imposition of morality, but through the struggle in the depths of individual souls? What is it like for you to shift from being the prime mover and actor in your life story, to becoming the receiver of the action of others? How might God be handing you over this Holy Week? Is there a relationship between your consent to being carried where you do not wish to go and experiences of healing and redemption in your life? News for Praying Life Readers! I am leading a workshop in April here in Topeka, KS. Hope to see some of you there! This entry was posted in Lent, Solitude, Spiritual Formation, Spiritual Practices, The praying life and tagged cross, God, Holy Week, Jesus, John of Ruysbroeck, Mark, Peter, Simone Weil, suffering. Bookmark the permalink. Today is a day to read, be quiet, study, be quiet, write, be quiet – with my prayers coursing through it all. Profound sadness as I hold myself into Maundy Thursday and Prayer Vigil and Good Friday musings. I refuse to hurry to Sunday. Thank you for more food for my soul. I too have been feeling the sadness of lent. Yesterday found myself in sorrow for the polar bears on their shrinking homes. We carry this burden we are blessed to bear together. Thank you, Milancie, for your gentle touches upon my soul. I AM SEEING THE NEWNESS OF LIFE COMING INTO THE WORLD . WHERE ALL WAS THOUGHT LOST IS BLOOMING HERE A NEW TURN OVER AND NEW BEGINNING HERE FOR EACH OF US WE LOOK ND SEE THE WONDER OF HIS LOVE ALL AROUND US IN EVERYTHING . TREES COMING TO LIFE AGAIN ,FLOWERS COMING INTO BLOOM AND OUR PRECIOUS LIFE TO CAN BE NEW AGAIN IN THE FATHER OF US ALL. TASTE AND SEE THAT THE LORD IS GOOD . MERCY AND GRACE ARE HERE ALWAYS FOR US . ALL BE BLESSED IN THIS KNOWLEDGE AMEN AMEN AMEN. But they have the most to Share!